On the day of the launching of Samsung Galaxy S II, Maxis also launched HTC’s most powerful smartphone, HTC Sensation. 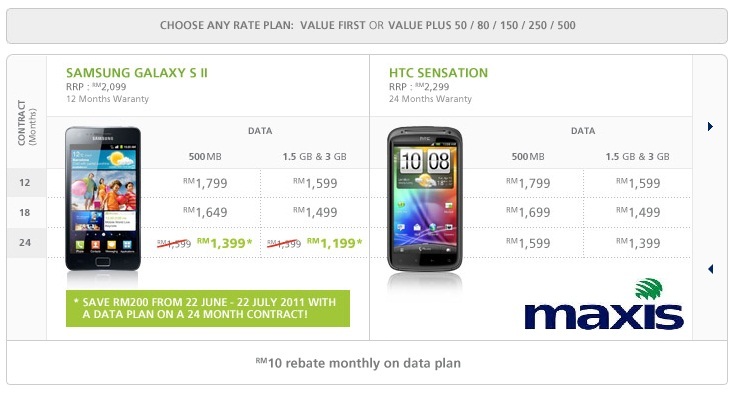 You can get HTC Sensation at RM1,399 with 1.5GB/3GB data plan on a 24-months contract or Rm1,599 with 500MB data plan on a 24 months contract. It seems that Maxis are more biased towards Samsung Galaxy S II with its grand launch and the discounts that they are offering. DiGi also offered HTC Sensation on the same day as Maxis. With 24-months contract, HTC is sold at RM1,399 and RM1,699 for 12-months contract. Which one telco operator should you choose if you are interested in HTC Sensation? I suggest that you take DiGi if you are living in Penang. Why? Based on my own experience, DiGi 3G and EDGE speed is way faster than Maxis. Sometimes, at certain location, DiGi’s EDGE is even faster than Maxis. If you are interested to know more about Maxis offerings, head on to their Android page. For DiGi, click here. What’s your say? Samsung Galaxy S II or HTC Sensation? Next story RM799 HTC HD7 from Maxis!!! Previous story Motorola Xoom 3G Is Available in Malaysia & Price is RM2,599!! !